Fluffy, buttery, creamy, sumptuous Italian meringue buttercream is perfect for piping and deliciously decadent for eating too! Sweet fluffy clouds of amazing Italian meringue buttercream are the perfect topping for cakes and cupcakes galore. Glossy white clouds of meringue stabilized with hot sugar syrup makes the perfect base for not too sweet and really fluffy buttercream. If you have been following along lately, you know that I went on a quest for the perfect combination of white cake and pipable frosting for my brother's wedding. I finally settled on the recipe to make their cake after a few tries. I am waiting for a good excuse to make another cake so I can share that recipe with you. Getting everything ready for the wedding prevented me from taking pictures and I don't have a single picture of a slice! 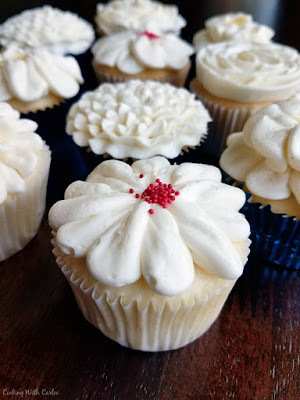 I did just share a great recipe for the perfect semi-homemade white cupcakes though and they are a great base for a fun frosting design! Anyway, in my quest I played with Swiss meringue buttercream. The results are very similar to the Italian version, but the process is a bit different. In the Swiss version you heat the sugar and egg whites slowly, whisking it to keep it from forming some sort of sweet scrambled egg whites. I would happily eat cake slathered in Swiss meringue buttercream any time. However, I much prefer making the hot sugar syrup and pouring it into the meringue as it whips. 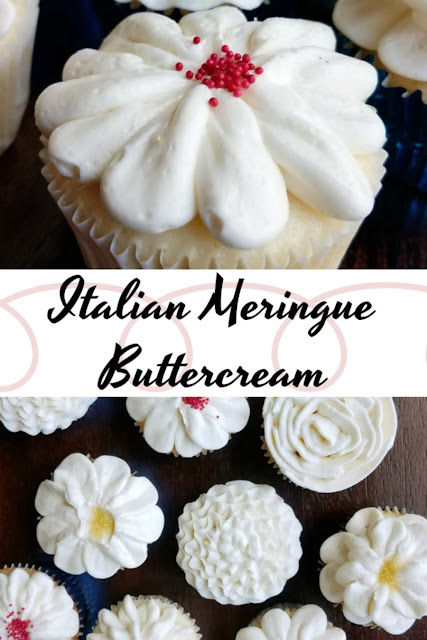 It's just a personal preference, but Italian meringue buttercream is superior in my book! There are a few things I really love about the recipe. The first is the lack of powdered sugar. Don't get me wrong, I love me some powdered sugar, but it certainly has a tendency to make a mess. That can't just be me, right? Plus with most of the sugar cooked into a syrup, there is no real way your frosting can be grainy. Just fluffy and creamy. If you are used to American buttercream, you will notice a few things that are different about this. The main one being how butter forward the final flavor is. The flavor of butter really comes through when it doesn't have to compete with cup after cup of powdered sugar. Also, this frosting stays soft. It doesn't crust like some buttercreams. It will set solid in the fridge, but stays really soft when left out. Despite it being a really soft and airy texture, it pipes really well and holds it's shape. It was hotter than hot on the 4th of July when I made these cupcakes. In the end, my brother and new sister chose an American buttercream for their cake and cupcakes. 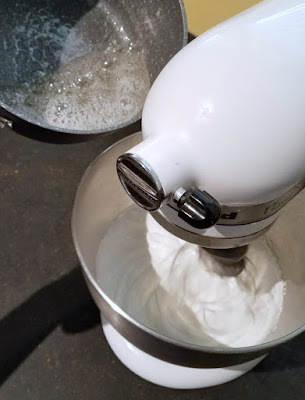 So I used our 4th of July gathering as an excuse to make more Italian meringue buttercream. I am sure it won't be the last time either! Place room temperature egg whites in the mixer bowl, but do not whip. Just get ready and set aside. Place a cup of sugar and 3/4 cup of water in a saucepan. 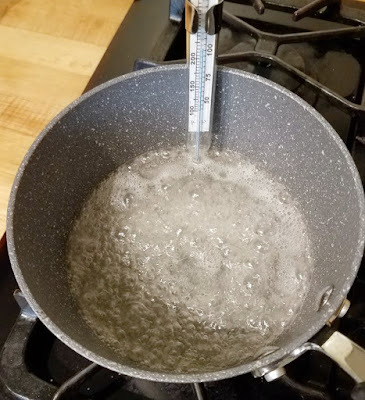 Insert a candy thermometer and heat over medium heat. Once the sugar syrup reaches 230 F, start whipping the egg whites adding a bit of the remaining sugar at a time until the sugar is all added and the egg whites start to form stiff peaks. 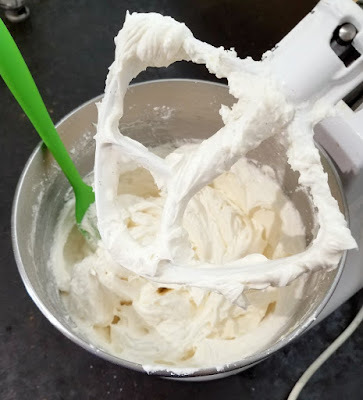 As soon as the sugar syrup reaches 240 F, remove it from the heat and immediately start drizzling it into the whipped egg whites with the mixer on high. You want a slow and steady stream and you need to be really careful, that syrup is HOT! Keep beating on high speed until the outside of the bowl is no longer warm, this can take about 15 minutes. Switch to the paddle attachment and turn the mixer back on to medium speed. Add the butter, about a Tablespoon at a time. Allow each addition to mix in completely before adding the next one. It may look funky a couple of times along the way, just keep the faith and keep mixing. Once all of the butter is added, continue to beat on medium speed for 5-10 more minutes or until super creamy and smooth. Add a pinch of salt and your desired flavorings and mix well. Pipe or spread on cooled cake. Loving the italian meringue buttercream frosting. One can never have enough frosting recipes! Thank you for sharing. I agree, we need a frosting for every occasion! You had me at 1 lb of butter..... yum. It's hard to go wrong when you start like that, right?! I love that you shared this recipe! I will definitely have to try. Thanks for sharing at Friday Frenzy Link Party!! PINNED! There you go again... you have me wanting to make cake and frosting! This sounds really good, but the process intrigues me as much as the end product! Hi Carlee, you are the Queen of frosting! The heat here makes working with buttericing a bit of nightmare and when I've made cupcakes for occasions they have had to stay in the fridge or slide. When I get round to trying it I will let you know for sure! Carlee, your buttercream looks so perfect! And your instructions make it sound easy. Thanks so much for sharing with us at the Whimsical Wednesdays Link Party! 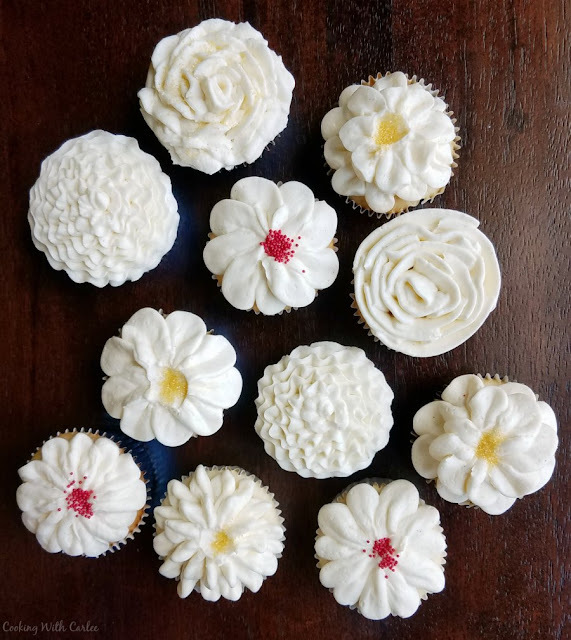 It really is easy and fun to do something a bit different than the standard American buttercream.